Body image is about so much more than your weight. Carly has a lifelong genetic chronic illness called ichthyosis form erythroderma (which means scaly red skin). Her skin gets itchy and sore and she gets infections easily, which sometimes result in hospital stays where she is bandaged up like a mummy. You can read more about her story here. There used to be colours I’d avoid wearing close to my neck. Black, bottle green and navy. They showed up my peeling skin – epidermal snowflakes on dark wool and cotton. I used to cover up, and be encouraged to cover up. Mostly because my skin made me feel embarrassed, and I didn’t want people staring at more than just my face. People assumed the worst – that I’d been “stupid in the sun” or in a fire. Plus I was conscious of getting skin everywhere. 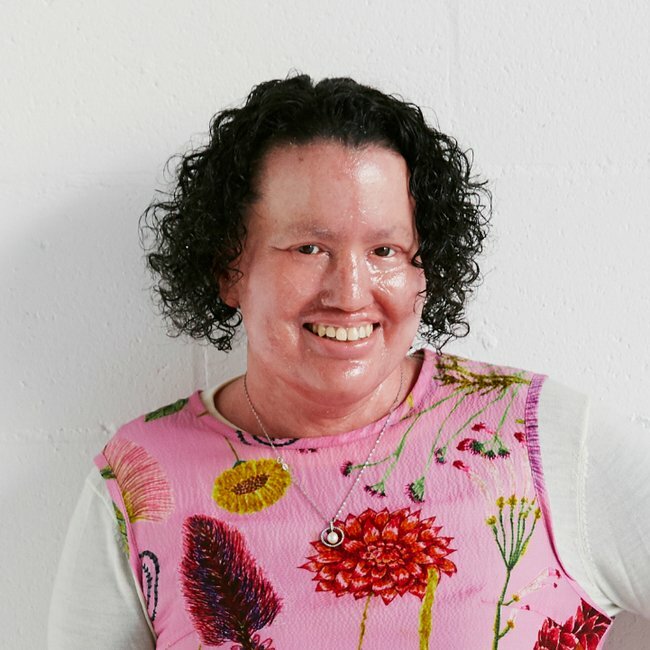 Positive body image is about ability, disability, scars and colour too – Carly Finlay. Now I still cover up, but not as much – only because it’s more comfortable to, rather than being cold and enduring the scrapes and knocks encountered in daily living. I wear little dresses layered over stockings and long-sleeved tshirts. And I always carry a jacket. I want to show off the favourite features of my body and I also want to show that people with visible differences can celebrate their appearance. I think body diversity and positive body image is so much more than size and shape. It’s about ability, disability, scars and colour too. We need to celebrate visible differences in all forms. Just as we need to show women of all sizes in the media to reflect our population, we also need to normalise difference. It’s ok for people with visible differences to be proud of our appearances. Years ago I wouldn’t have dreamed of wearing these dresses – especially not the strapless one. But they make me feel fabulous. And they make others notice what I am proud of. Carly Findlay is a 20 something Melbourne woman working full time as an events planner/writer and a freelance writer on the side. You can follow her on twitter here or read her blog here.